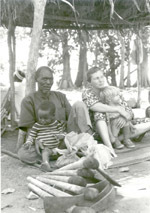 Description: Donna Entz (right) sits with Mussa Barro, eldest chief of the village of Saraba, Burkina Faso. Entz's daughter Aisha is on her lap. 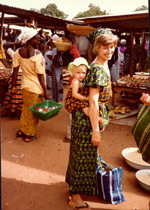 Barro's grandson Draman Ouattara is on his lap.